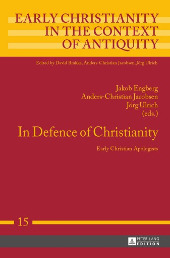 In Defence of Christianity: Early Christian Apologists, Eds. Ulrich, Jörg; Jacobsen, Anders-Christian; Engberg, Jakob; Trans. Gavin Weakley. (Frankfurt: Peter Lang Publishing Incorporated, 2014), 263 pp. As we have noted elsewhere, the task of apologetics is one that has been given to all Christians.1 Knowing how that task has been taken up by Christians in the past, then, can give Christians from all walks of life insight into how they may better engage in apologetics to God’s glory. In Defence of Christianity: Early Christian Apologists is a small but densely packed review of apologetics as it was practiced by Christians in the 2nd century, beginning with the much overlooked apologist Aristedes. The book then covers the usual subjects of interest in this matter – Justin Martyr, Tatian, Athenagoras, Theophilus, Mathetes, Clement of Alexandria, Tertullian, and Octavius/Municius Felix – following up with “the other side of the story,” which is comprised of translations of 2nd century pagan authors on Christians and Christianity. The last chapter is an assessment of how Eusebius employs the apologists in his Ecclesiastical History. The writers of the collected essays helpfully flesh out the historical context, shedding light on aspects of the apologists’ writings that may be confusing to present day Christians. For instance, within the early church writers there is a strong emphasis on the superior morality of Christians, an emphasis so strong that it could lead the uninformed reader to conclude that these men were legalistic and self-righteous, promulgating a religion of works over and against a religion of grace. This, however, is shown to be a misreading, for the apologists were merely engaging in polemical rhetoric against the pagan philosophers and religious cults of their day who boasted of their moral superiority. The superior morality of the Christians, then, is not always referring to direct actions of Christians, but primarily to the consistency demonstrated, largely considered, between their moral precepts and their daily lives. Along these same lines, the authors of In Defence of Christianity do an excellent job of showing where the early apologists utilized, rejected, and reformed philosophical concepts (primarily the Platonists, but to a lesser extent the Stoics) pertinent to their stated apologetic goals. While some of the language of the Platonists and Stoics was appropriated by the early apologists, moreover, these authors helpfully explain where they differ. For anyone familiar with the theoretical reconstructions of early Christianity by unbelieving scholars like Elaine Pagels and Bart Ehrman, scholars who deny that there was any single Christianity and argue instead that there were many Christianit-ies (among whom they count the Gnostic heretics), the clarifications of the authors of In Defence of Christianity come as a much needed breath of fresh air. While there were differences between the apologists, there was much unity in central doctrinal matters, doctrinal matters that set Christians apart from their pagan critics and enemies. Practically speaking, this book offers contemporary Christians insight into how apologetics was not merely a method of persuasively debating unbelievers and demonstrating the truth of the Christian religion, but also a genre of writing that had clearly discernible features. Among those features, there were addresses to persons of power, reductio ad absurdum arguments against the pagan gods and philosophers, arguments demonstrating the superiority of Christian morality to that of the pagan religionists and philosophers, and a demonstration of the antiquity of the Christian faith (another apologetic maneuver that may be misunderstood by contemporary readers of the early apologists, in which the apologists argue that the Old Testament was the first work to contain metaphysical and moral philosophy that was later stolen from the Scriptures by the pagans under the influence of demons). This focus of the book at least raises the question of genre for contemporary Christians – Should Christians employ a uniquely Christian apologia genre? What would or would not be the benefits of doing or not doing this? Is there Scriptural justification for doing so? Perhaps one of the most helpful suggestions these authors give is that the contemporary Christian consider the fact that the world of the early apologists was not yet Christianized. The time period was still predominantly pagan, and this meant that the apologists were played an important role in explaining the Christian faith to outsiders who may have hear that Christians were incestuous, atheistic, cannibalistic, haters of humanity. And in this respect, the early apologists can give us direction as to how we can, in our “post-Christian” society, persuasively defend the faith once for all delivered unto the saints. Although In Defence of Christianity is intended for a scholarly/academic audience, its content is valuable enough to warrant even the non-academic’s attention. It is highly recommended for all who are seeking to properly understand the early apologists, as well as utilize the best of the argumentation and rhetorical strategies that they offer their readers. 1 See Diaz, Hiram R., “What is Apologetics?” Biblical Trinitarian, http://www.biblicaltrinitarian.com/search?q=What+is+Apologetics.